Photostimulable phosphor (PSP) imaging, also commonly known as computed radiography (CR), employs reusable imaging plates and associated hardware and software to acquire and to display digital projection radiographs. Procedures to guide the diagnostic radiological physicist in the evaluation and continuous quality improvement of PSP imaging practice are the specific goal of this task group report. 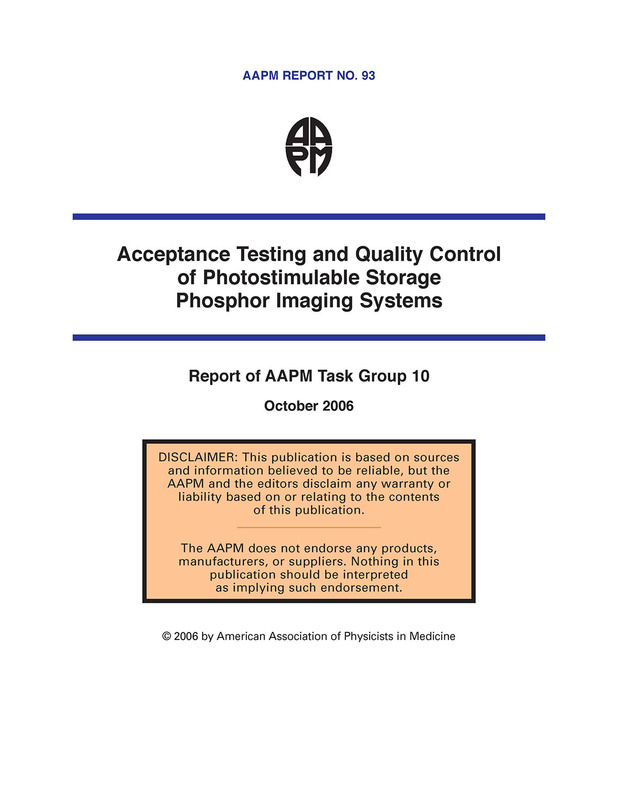 This document includes an overview of a typical PSP imaging system, functional specifications, testing methodology, and a bibliography. The main body of the report includes a description of generic, non-invasive tests that are applicable to a variety of PSP units. Since the inception of the task group, technological advances have changed the scope of its original goals. In particular, when the task group was initially formed, film was the chief display medium, and video display monitors and associated analysis software were not widely available. Also noted are the significant advances of “direct radiography,” which includes the direct acquisition and readout of projection radiographs without physical handling of a PSP imaging plate. The user of this information should realize that technological change is constant, and many of the tests described in this document might not be applicable with the current state of the art. In these situations, the user is encouraged to consult the manufacturer, the American Association of Physicists in Medicine (AAPM), or other pertinent contemporary sources for additional information.